This exceedingly smart two-piece typifies Michael's tailoring prowess. 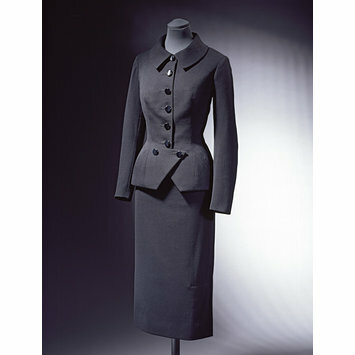 He created understated suits in the colours of the city - grey, black and navy blue - and always gave them distinguishing details. In this case, the natty fitted jacket has a single-breasted fastening which extends to become double-breasted just below the waist and terminates on a triangular cut-away. The jacket is padded at the hips to create a clightly curved profile over a straight-cut skirt with a front-right kick pleat. 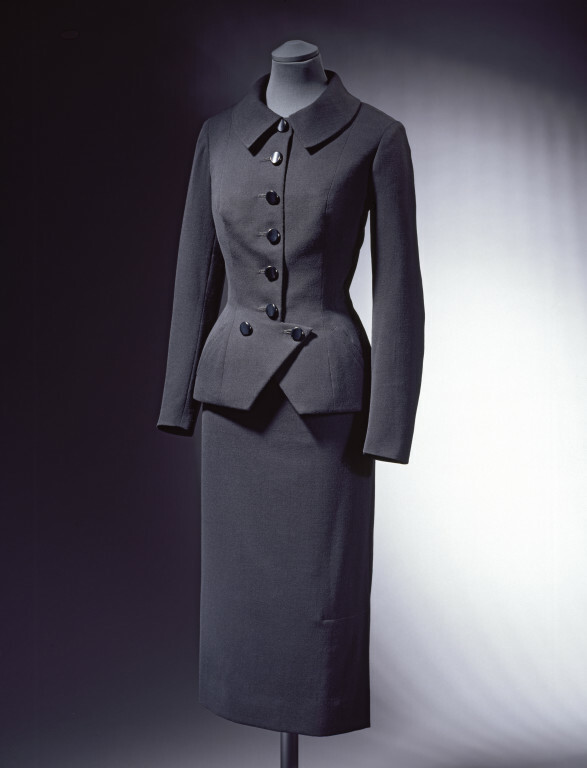 Slim fitted two-piece suit consisting of a jacket and skirt of fine black worsted wool garbardine. De La Haye, Amy, ed. The Cutting Edge: 50 Years of British Fashion 1947-1997. London: V&A Publications, 1997. Wilcox, C. ed. The Golden Age of Couture. London: V&A Publications, 2007, p. 98 & pl. 4.7. Mendes, Valerie. Black In Fashion. London: V&A Publications, 1999. Also known as Michael of Carlos Place or Michael of London.